↑ Tim Richardson (28 Jan 2003). 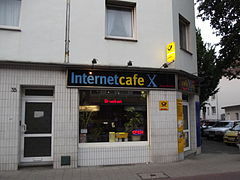 "EasyInternetcafe loses CD burning court battle". Retrieved 2015-09-05. ↑ Sofia Celeste (October 4, 2005). "Want to check your e-mail in Italy? Bring your passport.". Retrieved 2015-09-05. Hong, J. and L. Huang (2005). "A split and swaying approach to building information society: The case of Internet cafes in China." Telematics and Informatics 22(4): 377-393.